On June 17th I am going to be kicking off the “We Can Do It! Skill Builder Sampler.” You can just call it the Skill Builder Sampler or SBS if you want. :) Some of the recent blogland talk got me thinking about things that I want to try out in my quilting. I realized I was just a bit scared and nervous about trying new things. It is always easier to try something new with a friend and so I hope we can all work through this sampler quilt together. Each month I will focus on a different quilting skill and provide tutorials for three 12 inch quilt blocks using the month's skill. Some of the skills you might already have – please, leave any advice or additional tips in the comments for us – but I know there will be something for everyone to learn. I have designed this sampler so that a beginning quilter can easily move from block to block and build their quilting skills. The beginning blocks will review basic skills and concepts that can be applied to any quilt. I will liberally reference other blogs and tutorials which have already described and explained the techniques and skills we will be learning. Skills: Cutting, ¼ inch seam allowance and value. May: “There's no way I can sew that block!! !” - but you totally can because we now have the Skillz. By the end of the year you will have 36 twelve inch blocks you can make into a queen sized quilt or you can divide them up and make several smaller quilts. But more importantly, you will have the skills and the confidence to tackle any quilting project you can dream up. Priceless. For this to work, I need your help. Doing new things is fun and easy with friends, but truth be told, I don't have a million and one online friends. 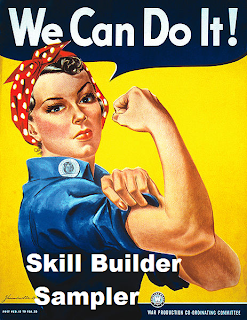 Truth is, not everyone will want to participate in this Skill Builder Sampler. That's ok, but I want everyone to be able to check it out and decided if it is right for them. Could you help me get the word out? I'll bribe you.... :) I have two fat quarter stacks of fabric just waiting to go to a good home. One of Denyse Schmit's new line of fabric and a stack of Japanese fairy tale prints. Leave a comment. Any advice, block suggestions or skills I am missing would be great. Oh, and tell me which fabric pack you will like. Blog about The Skill Builder Sampler, connect back here and leave a second comment telling me you did. Put the “We Can Do It” button on your sidebar and leave a comment telling me you did. Three chances to win! Please leave a separate comment for each entry. I will close the drawing and announce the two winners on June 1st. Thanks for helping spread the word! We Can Do It! Edited: I have posted fabric requirements here. Edited: Sorry this post disappeared for awhile - it is back! The giveaway is now closed, but keep spreading the word and get ready for our first block on June 17th! I love this idea. . I'm totally in. It is awesome to learn these things with others. I'm not sure I can commit to completing every month, but I'll try. And I'll blog about it soon to help you out! You might want to include a total fabric requirement and a full supply list so that people know what they will need to purchase. I don't have an active blog, but I'll share on facebook, if that's okay. The fairy tale fabric is sooo cute! I can't wait to follow along and learn more - my first quilt was a rail fence (i think it was called) made with the first old red barn company quilt along. I was reviewing the ORBC flickr site when I saw your crazy quilt along and was reading those posts when I found the skill builder sampler! Just a few ideas of things I would have liked to know when I first started. Maybe a post of the basic tools such as a rotary cutter, cutting mat and ruler(s) that make a quilter's life so much easier. As a beginner, it can be easy to overspend because you don't know what is necessary vs. what is nice to have but not required yet, if that makes sense. Also maybe talk about what the different pre-cut fabrics are (fat quarters, charm packs etc) and how to choose fabrics (always a toughy for a beginning quilter) that coordinate and contrast appropriately. I love looking at fabric, but have a hard time knowing what will look good when put together - it can easily take me hours to pick out a set of fabrics for one quilt. Thanks for putting this Skill Builder Sampler together! I doooooooo wish I could be more like Leila! Hi, I love the Japanese fairy tale prints they remind me of a story book I had as a child. I put up a comment about 'The skill builder sampler' on my blog page and to connect back here. I also Put the “We Can Do It” button on my sidebar. I am looking forward to this challenge. Thank you for the opportunity to play along. I can't think of any other blocks, but I'm a beginner quilter anyway. Will be watching with interest. I liked the Denyse Schmit fabrics best. Siobhan's extra comment for blogging about it. Siobhan's extra comment for putting up the button. I'm a real beginner - I have finished one small quilt (strip piecing) and am working through the Modern Quilt Sampler from Oh! Fransson; I've made a sandwich and am ready to start quilting in the ditch. I thought I would join in until I read the list - some things don't really interest me and some are just scary! But it wouldn't hurt to have all tese skills, would it? I would love to win the Japanese fabrics, but in truth would love either. The sampler looks like fun. Health prevents me from committing to anything, but I may stop by to see what happens. I made my first quilt two months ago and I cannot tell you how excited I am about this! I'm so pumped. Seriously. I feel like I don't know anything about quilting, so starting from the beginning and learning increasingly more difficult skills is just perfect. Thank you so much. I blogged about it. Also, maybe you can start a flickr group so we can all share photos of our progress. I always love seeing what everybody else's ideas are. This is a great idea. I read about this on another blog - sorry I can't remember which! I don't have any suggestions for you, I think you've got it covered! I'll be learning along with everyone else as I'm still a bit of a newbie to quilting. Oh and if I were lucky enough to win I would go with the DS fabric - so lovely. I put the very striking button in my sidebar! Can't wait for it to begin! So glad you included inset seams....my nemesis! I think this is great and I will definitely follow along and spread the word. I like the Denise Schmidt fab! I blogged about your Skill Builder event at JustPlainLaine.com! Button is on my blog! My son is gonna follow along as well - he is just starting quilting so will definitely be a great event for him! Thanks again. I just can't wait to join in! I have blogged about your QAL for you to try and encourage others to join in1 You can see it at: http://fabricallsorts.blogspot.com/2011/05/skill-builder-sampler.html I would just adore the 'Denyse Schmit's new line of fabric' fat quarter pack! Just thought that I'd mentioned that I also put your button in my sidebar: http://fabricallsorts.blogspot.com/2011/05/skill-builder-sampler.html If I am lucky enough to win a prize, I would adore the 'Denyse Schmit's new line of fabric' fat quarter pack! Good Luck and I hope that this brings you many many subscribers! great idea,learning new skills.sure can use that. No blog but will follow along. love Denyses fabric. Maybe post about what areas we are having trouble with for that specific block of the month or any ideas to get around trouble areas. So maybe set up a forum or just use your blog comment section. BTW, I am in. I was looking at a magazine today at Joann's specifically designed to show you how to put different blocks together--very cool. I wrote a few down that I liked. Just realized that you are from the Midwest too! I am originally from WI. Yippee!! Sounds great. Will we get notice when you are starting or I just have to remember. I don't blog so this is my only comment. Either fabric group would be great. Just what I need to take the plunge into quilting! Thanks. I love both fabric stacks. Not sure from where I "stalked" upon you, but glad I did. Would love to join this skill builder. I have been quilting for over 20 years, but even us "oldies" can get a bit lazy in our desire to get things done now. I would love to see you do the Grandmothers Fan or something like it. I love the pattern and don't find it hard. I was in a flickr block swap and choose this pattern. I was surprised at the frustrastion level of the other members in doing the curves. I added the button;-) In order to spread the word. As I have made a serious attempt to downsize my fabric stash, I will pass on the fabric, beautiful as they are. i think fabric selection, value, quality fabric, washing fabric, fabric storage, tools etc could use more attention. OK! I blogged it up for you. :) Hope you get lots of participants. I posted your button on the side . . . can you tell I want to get my mitts on your Japanese fabric stash?! LOL. I really love this idea! I will try to blog about it when I'm home from work! What a great idea! I may just have to join along! Sorry I don't have any advice...maybe just make sure you stay ahead of the group! I love the Japanese fabrics! sweet idea! I can't wait to learn paper pieced blocks! The curves tutorial is a great idea! I've never done them before. I would love the DS Quilts fabric. Thanks! I am going to definitely do this! I am also going to email all my quilty friends and my LQS about it. Maybe a group will do this together. SO much fun. FOr the fabric - either one is so beautiful, I cannot choose. Sounds like a great sew along. I don't have a blog, so can't help you out that way, but will definitely tell all my real life sewing friends. Thanks for the giveaway, love the Japanese fabric. What an awesome idea! This is exactly what I needed too. I've been stuck on making simpler quilts because I didn't want to commit to something hard and give up on it but with each block being different this will be perfect for me. I just found out about this quilt along from Skook's Playground!! I so want to join in the fun and improve my quilting skills:) I'm so excited!!! I haven't read everyone else's comments so I don't know if this has already been said but I would be interested to see a post about 'things I wish I had known when I first started quilting' that we can all contribute to. Like the importance of a 1/4 inch seam allowance, pressing the seams (whether open or to the side), how fabric stretches if you cut it on the bias, that you do need to change needles on your sewing machine more than once a year, that sometimes your sewing machine will not like the thread you are using and you will have to change it etc etc etc! Denyse Schmidt for me please! The button's on my sidebar! So crazy - I've been thinking about doing a sampler lately after reading a few of the Elm Creek Quilters books. Love this idea - can't wait to get started. Would you be able to tell us how much fabric we will need for the whole project? Give suggestions on whether we should use 1 line for this sampler or make each block super random/unique? Might be nice if you could show us each block in a few colorways - maybe one you made and then a flickr list of ideas from others, so we can get ideas of how cool these blocks can look? Might inspire and motivate us. This sounds a great idea! I'm sure you can help me with my curve phobia! This looks really fun...and challenging! Not sure I can keep up with you as I'm expecting baby #2 in July, but I'll give it a shot! I love that Denise Schmidt fabric! And I put your button on my blog! I found you from http://littleislandquilting.blogspot.com/ and am looking forward to your sampler! I would be happy with either fabric pack! I put your button my blog. This sounds awesome! Great idea for a workshop! I have no advice what so ever as I am a pretty new quilter. I have not dared moved beyond putting squares or rectangles together yet lol. So ty for doing this and I will LOVE to partake in it. I am a new follower, as for fabrics...who wouldn't love either of them! ty! I've got to go with the Japanese prints! I stumbled across you via another blog and I am now your newest follower. My quilt skills need some help so I am VERY looking forward to this!!! I added your button to my sidebar!!! I'd love the first bundle - thanks for the chance! I like either fabric pack, they are both really nice. I think the topics you are covering are good. I have done quite a bit of quilting but have never tried some of the topics you are going to cover. The only thing that might be good would be to discuss yardage and how to figure out how much fabric you need. I used to work at a quilt shop and that was something we got asked a lot. I'm in! I just started quilting in January and really need to build my skills. I like the Denyse Schmidt line. I also need to build my skills in binding, sandwiching the quilt and back together, and machine quilting it. I don't know if you want to go there or not. But I will love it regardless! Thank you ...am looking forward to learning more! I just posted your button and am going to blog it right now. Will you invite people to participate in the Sampler or is it open to anyone? I like both sets of fabric. I am wondering if you might include (or start with) how to prepare and cut fabric for a quilt project? I love the Denise Schmidt fabrics! oops…… forgot to also say I like the Japanese prints. What a fab idea! it is daunting trying new things on your own especially just for the sake of it! SOOOOOO excited! You sound just like me- want to try new things and not a ton of online friends :) I am all over this idea- and soooo excited to learn about hexies :) Thank you and I would love the DS fabric! Oh this sounds fun! I love the japanese fabrics!!! I'm going to check it out. I'm always curious whether other people use steam in their iron when they press. I use it but I think some people feel that it makes the fabric more likely to stretch. I love the Japanese fabric pack. I will play too. I need to work on some skills. I like the fact you are starting in June. It is so much better than at the beginning of the year! What a fabulous idea and it comes at the perfect time for me as I've been thinking about giving quilting a try for a while now. I'm following your blog now and can't wait to start! The top set of fabrics are gorgeous! this sounds great! i want to learn several of the skills on your list, so i'll definitely be playing along. and those denyse schmit fabrics are looking really cute. Just stumbled on your blog. I'm in, although some months may be more of a challenge for me to get the blocks done. I love that you've got so many different techniques covered! I like both fabric bundles! Your list of skills is pretty much what I teach for an adult education class. Something else I teach is quilter's maths but you may cover that as you go. Definitely curved piecing, but also equipment information like needle size and thread quality/choice. More background information and process inofrmation. Thank you for offering this opportunity. I need to build on my skills. Will definitely participate. I don't have a blog, but I will pass this along to my quilting group ladies! This looks like fun! Some of these techniques are ones I've never tried, so one block a month sounds very doable! I can't give you advice because I have no idea what the eff I'm doing with sewing, but I am joining in! the only thing i was going to add was to add fabric and supply requirements like wendy mentioned, but it looks like you have already put this in another blog post. off to read that now. i don't have a blog that more than 5 people read, so i am pinning this to pinterest! and i am loving the DS fabric! Ooh, I just did the Supernova quiltalong at Freshly Pieced and was fretting throughout about how my cuts and seams were wobbly. I suspect I've developed some bad habits due to mostly being self-taught, so this looks perfect for me. And both sets of fabric up for grabs look lovely, so I'm not sure which I'd choose if I won. Crossposted to both my LJ and Dreamwidth accounts. I'm not entering the contest, as I have no advice to give, however, I am SO EXCITED for this quilt along!!! I have never done one before, but this one seems like the perfect one to start with to improve my confidence as a quilter. Thank you so much!! I think it's a great idea. I am not a beginner, but not a pro either, so I think I will join in. It is fun sewing along with others too! I would really love the Japanese Fairytale fabrics!!! Love it! The Japanese print; I have a friend who is Japanese whose wife is due in November. This would be PERFECT! Buttoned! I'm so excited about this one! If not for beginners, but for everyone! Great idea, Leila! I will definitely blog about it, and count me in! I might only make 1 block per month but am really looking forward to building my skills up, esp on harder styles like paper piecing, etc. So thanks for the opportunity and all your hard work! And I like the DS as we can't buy it here in the UK. Hello, found you via Lee at Freshly Pieced. I am definitely up for this, I haven't got as far as paper piecing so would be especially looking forward to that month (I've never done anything with Hexies either). will add your button shortly! I don't really have suggestions for other content. Looks like you've got it covered. My favorite would be the Denise Schmidt fabric, but both are pretty. 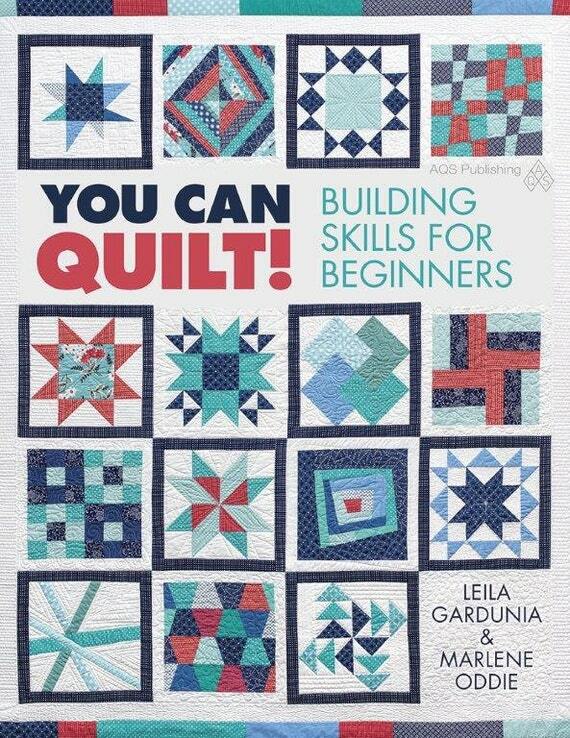 I'm so excited to find your skill builder sampler! I can't wait to learn new skills. I've been quilting 10 years, but there are several I've never attempted. I love both sets of fabrics! This is a great idea. Thanks for sharing the skills. Look forward to following along. I have blogged about the series you are planning. I have to admit though that my blog is brand new so I have a readership of about one! Button has been added to my sidebar! I dont know what additional information i can include for you... I think you might have this down packed! i look forward to this!! and love the Japanese fairy tale prints! Your on my side bar! I have only just made a few blocks so this will be a fantastic way to learn to do more! I've added your Skill Builder Sampler button to my sidebar on my blog. Sounds great! I am most definitely a beginner, and I will be following along. Thanks for the series! I would literally die over the japanese fairy tale pack. I posted the button to my sidebar! Curves, paper piecing, applique; these are all things I have been wanting to do, but was overwhelmed to try on my own. What a great idea to put together a BOM! I'm in! This sounds like fun! I took a basic quilting class at Joann's a couple of years ago, but I haven't done anything since. I love the Denyse S. fabrics! What a great idea! Thank you for putting this together. It is always good to learn new skills. I like the Denyse Schmit fabric. As a beginner, I am very excited to follow along with you! This is a fantastic idea! I don't have any ideas of what else to include, because I don't know anything yet, so I really need this! I'm excited to get started. I am excited to follow along and learn some new techniques that I haven't tried before. I definitely want to try this out. I am an absolute beginner so it would be great for me to learn all these skills. You briefly mentioned scale on the fabric requirements page but could you be a little more specific? I'm thinking of getting a fat quarter bundle if I try this quilt-a-long and I want to be sure I don't end up with a bad mix of print sizes. Thanks so much for organizing a fun way to improve skills. 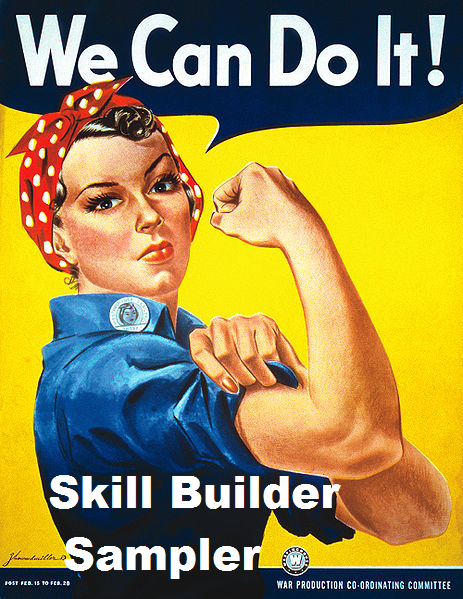 I have posted The Skill Builder to my blog and Twitter pages. I also have the really cut Rosie badge in one of my side bars. And last but not least... for the very last month or as a bonus month catherail windows would be a great skill builder. I will be joining in! Maybe not all of it but I will join in on it. As for the fabric choise. It is a toss up for me. I love them both! I'm in, I'd love to make all of these blocks! What a great idea! I am so glad that I decided to "follow" after checking out your blog through the Blogger's Quilt Festival! I love this because I may have done all of these, but I like something that "forces" me to do them again!!! Will be posting sooner than later on my blog! I will definitely be participating. I'm a n00b! Looking forward to it. How about a Flickr group so we can all see each others progress? Have you thought about pressing? I have discovered that a lot of people do not know how to press properly, especially when it is multiple seams coming together, like in a pin wheel. this is such a great idea! I am really looking forward to it. I would love to learn more about how to chose fabrics. My advice is to describe every step, even if it seems obvious from your included pictures. I've learned that some folks are visual and understand the pictures and some folks do better with the combination of verbal instructions. I LOVE this idea as I have been looking for a way to appropriately challenge myself and step outside my comfort zone. Thanks for doing this! I think this is a fantastic idea and will be following along. I am always thinking about beginner quilters and how to present different techniques and skills when I choose the blocks we make for the Block Lotto. How great for beginners to take a tour of quilting techniques and end up with a lovely sampler quilt. ... I've added a post about SBS to the block lotto blog, here. I think we both want to help beginners learn new skills and I think some of the newbie quilters in the Block Lotto community would love to join you. I am so excited!! I can't wait to start this. Definitely do something with apple cores when we get to that, I have been wanting to try it but was too scared. wow, what a fantastic idea. I have yet to make a quilt and this seems an ideal way to start. I'm in! I love both fabric sets! Love the DS fabric. Great ideas! Sorry, this isn't any help, but I do love hexagons! And ooh, LOVE the japanese fairy tail prints. Those are gorgeous and look like so much fun! I'm still a beginner and out reading blogs trying to get inspiration myself, so I really don't have anything to suggest to you. But I do want to tell you I love the Japanese fairy tale prints. I ADORE the fabric with the big eyed children! This looks like a lot of fun! I could definitely stand to learn these skills! I love the DS fabrics! I think you've covered all the bases, this skill builder series sounds great. Denyse Schmidt fabric is the one for me. Love that Japanese fairytale. Skill building is what I need. I love using paper templates to help me quilt. I'd love the Japanese fabric pack. I have no advice, as I am a novice quilter. I need to do more quilting. I love the Denyse Schmit fabric too. I am rather new to quilting so this is exciting to be part of this. I do not have a blog but will email my quilting friends and members of the quilting guild I have just joined. Great idea! This is a great idea. I need to push myself to learn new techniques and you are so right that it's much less scary if others are doing it with you. I'm looking forward to it! And I love the Japanese fairy tale fabric. Thanks for this chance. Looking forward to getting started. I've blogged about you and this QAL!! AAAAAAND I've added your WE CANDO IT button on my sidebar. Phweee, three chances now used. Denyse Schmit's fabric looks wonderful, and would be my pick. Good luck with the exciting QAL. i have never ever quilted before, so i would love to have this be a wonderful resource and "class" of sorts! nothing is too simple to expand on when it comes to beginners! love Denyse Schmit's new line fabrics you posted!! I think this is a great idea! I really like the pak with the red fabric.I'm wondering if you will ahve some applique. I'm always reluctant to try that. I really like this idea & would love to be a part of this. Reading the list made me realize how much I need this, most of the subjects either scare me a bit or I'm unsure of what they are exactly. I would love the Denyse Schmidt fabric. Thanks. There are a lot of skills in your list that I could use some practice with! Great idea!! I would love to win the Denuse Shmidt fabric pack, especially! I think this skill builder sound great. I will pass it along to my quilt group IRL. I would love the fairy tale prints. I love this idea! i'm joining...though I have a 10 month old so don't know how I'll fair but I'll give it a go. I will post about this soon and put a badge up...thanks! I can't decide between the fabrics...both gorgeous! Both sets are gorgeous, but I like the first set best. I love your idea of skill building! I'm definitely intimidated by quilting so I'll be checking in to learn with you!